Glenn Rhee: Dead or Walking? Six seasons in The Walking Dead writers have proven they’ve still got it. Sunday’s episode contained the brass ring for a television show – a watercooler moment – something increasingly hard to come by as delayed viewing fractures audiences. But today both individuals and the media are poring over and dissecting one two minute scene of episode 3, titled Thank You, debating the question is he or isn’t he? The focus of the heartache? Glenn Rhee, played by Steven Yeun, one of the few season 1 survivors still on the show and a fan favorite. Growing from a pizza delivery boy into a family man, Glenn has been scrappy, smart, and a kindhearted, centering force of humanity in this bizarrro apocalypse. But on Sunday night he fell into a slathering zombie hoard and appeared to meet death. Worse, he was laid low by Nicholas, an unlikeable fellow that nobody will miss. i don't know who glenn is but i hope he lives. this boy got fans. After a few moments of disbelief people began analyzing the scene and questioning whether we really saw what we thought we saw. Nicholas and Glenn flee a massive zombie mob and are trapped in a fenced alley. They climb onto a dumpster and search frantically for escape. Nicholas, realizing the odds, and perhaps that he’s kind of a tool, starts freaking out while Glenn tries to calm him down. Nicholas shoots himself in the head and falls off the dumpster. Glenn is hit by Nicholas’ falling body and knocked off the dumpster. And it may all be a massive misdirect. 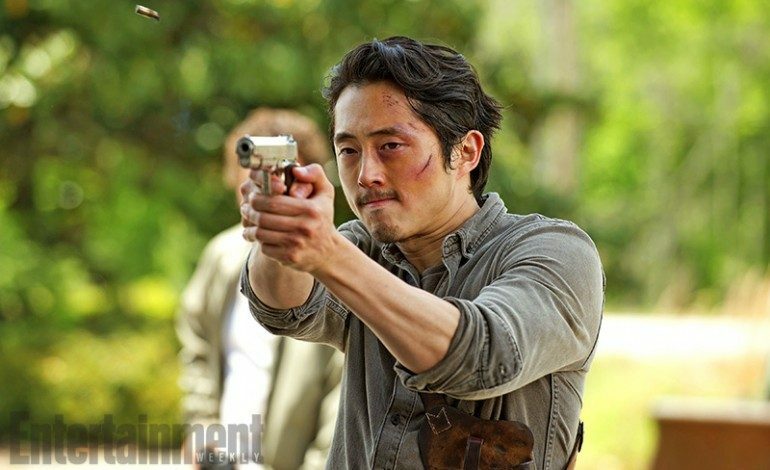 Here are the compelling reasons why Glenn will be back(! ), at some future time. Dear fans of The Walking Dead, this is a hard story to tell and when we were planning to tell we knew our friends at ‘the Talking Dead’ would be talking to you about it and knowing you’d all be talking, and feeling and commiserating, I knew we should say something about it lest our silence say something we didn’t mean to say or not say. So I’ll say this: In some way, we will see Glenn, some version of Glenn or parts of Glenn again, either in flashback or in the current story to help complete the story. Steven Yeun has been photographed on set in future scenes. 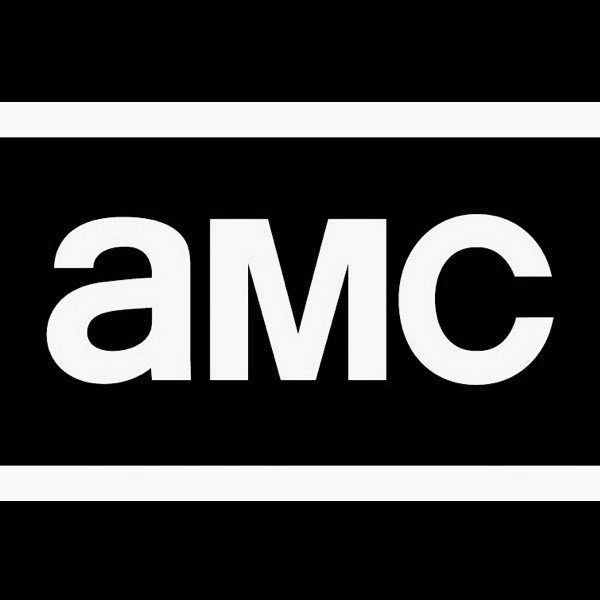 In the comic series Glenn dies from a brutal attack by yet-to-be-introduced character Negan. 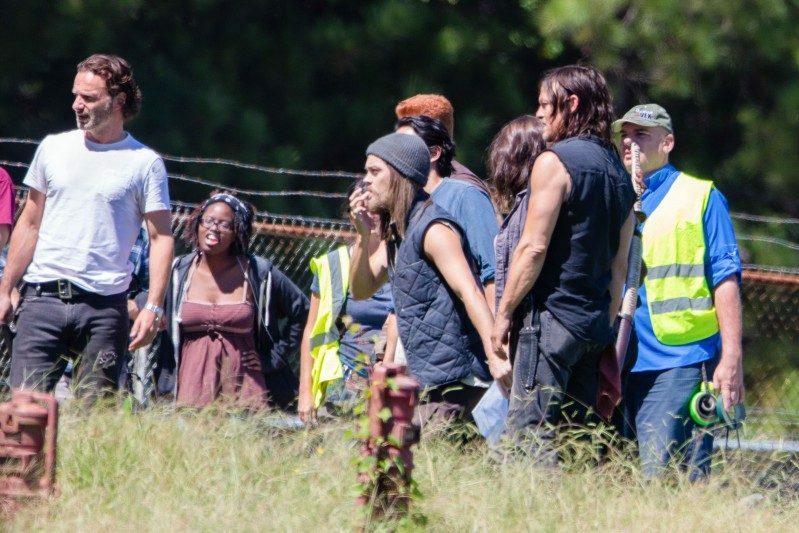 There’s no casting news for Negan yet, but there are signs the series is headed toward that storyline, including this photo of an actor widely thought to be in character as Paul “Jesus” Monroe. 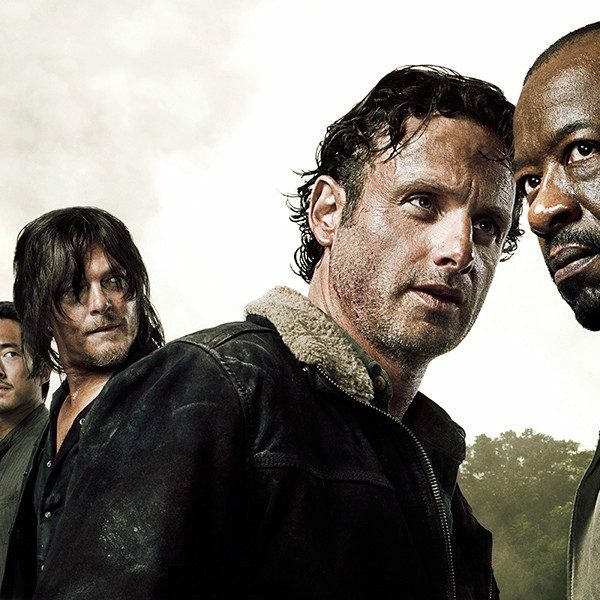 Jesus storyline dovetails Negan’s, so it’s apparent the show is headed that direction. And there in the photo, just behind Jesus, in a blue shirt is Glenn. Unless they’re planning some time-travel magic to create flashbacks featuring a character who doesn’t exist yet, it stands to reason that Glenn will be back. We didn’t see Glenn die. Sure, we saw entrails being pulled from a chest but the director worked very hard to be sure we couldn’t see them coming directly out of Glenn’s body. In fact you can’t even tell what color shirt is on the corpse the zombies eat as it is immediately covered with hands, then blood. As Glenn fell, it was obvious Nicholas’ body was on top of him so it stands to reason he’s watching Nicholas being torn to shreds, justifying the horror on his face. The camera angle makes it look like the carnage is taking place several inches higher than Glenn’s face, which would make sense if there was a corpse on top of him. It also makes sense that if Glenn were being eviscerated he would pass out, or be writhing, rather than lying flat like he is pinned. It’s just too convenient. Glenn is a smart guy who’s survived years of these walkers now. When he runs into the alley he’s running toward a chain-link fence topped with barbed wire. Anyone with his experience would go for that fence and skip the dumpster altogether. Granted, he was trying to save Nicholas too, and helping people is Glenn’s specialty, but it seems too convenient that he led them to be trapped on that dumpster. Even after they were up there it would have been a fairly short jump to the fence, and he would have been trying to point Nicholas to that way out – unless the writers didn’t want him to. If you still don’t believe, check out this crazy moment posted by an uber-fan. Members of Team Glenn think he managed to scoot out from under Nicholas’ body and under the dumpster while the walkers were distracted and he was covered with blood. This enlargement purports to show it. Then again this whole thing could be a massive double-blind. We’re about to head into sweeps month for ratings, so leaving that little bit of hope could keep viewers tuning in to see if Glenn comes back. The last thing TWD writers need to be doing is chasing ratings, but TWD has never been a show to rest on its laurels. And naysayers would point out that the episode was also chock full of little moments of Glenn flashbacks to previous seasons, which could have been foreshadowing that this was his last episode. Until we know more, what do you think? Is he or isn’t he?